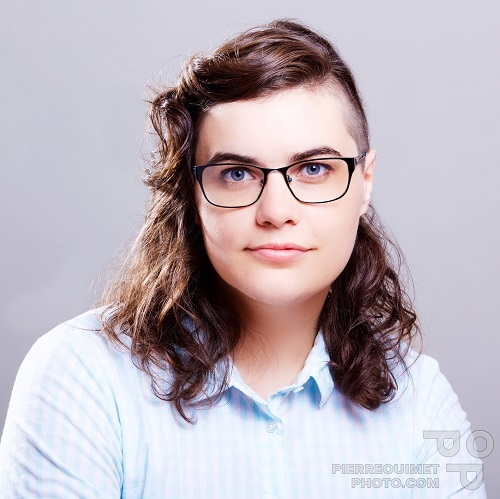 Marie-Pier Boisvert (she/her) is the Executive Director of the Conseil québécois LGBT (Quebec LGBT Council), Quebec’s top reference for LGBTQ+ advocacy. In order to make sure all gender and sexual diversities are recognized, the CQ-LGBT seeks to strengthen the rights we’ve acquired, and actively campaigns for the rights still being denied to some. The Council also ensures that the province’s policies and guidelines are adapted to the needs and realities of LGBTQ communities. Acting as a federation, the CQ-LGBT hopes to unite its members’ voices and spread the resources, leadership, education and creativity they put forward every day. Through her job at the Council, Ms. Boisvert is a consultant for various Quebec and Canadian ministries on gender and sexual diversity issues. She is a co-researcher for the SAVIE-LGBTQ project of the Research Chair on Homophobia at Université du Québec à Montréal (UQAM), and she’s been on the scientific committees for various conferences in LGBTQ+ rights. She was a trainer and speaker at GRIS Estrie and GRIS Montréal, and co-founded Sherbrooke’s Pride in 2013. She holds a master’s degree in literature from the Université de Sherbrooke where she explored the representation of polyamory in Quebec literature, and published her first novel, Au 5e, in 2017. She has given several lectures within the context of her work and studies, notably in Sherbrooke, Montreal, Ottawa, Halifax and Berkeley.